This map provides an overview of satellite detected waters in Hai Phong province, northern Vietnam. 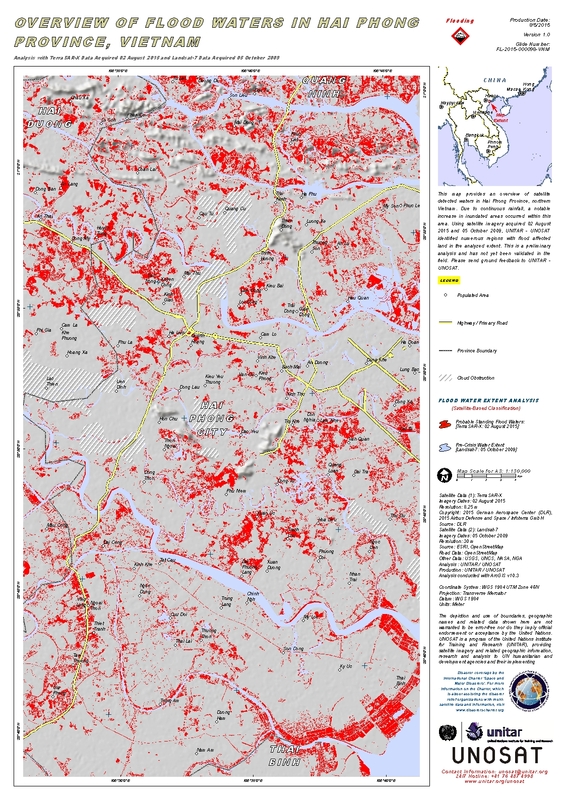 UNITAR-UNOSAT identified 18,982 hectares of flood affected land within the analyzed region. A total of 19 analyzed districts in the provinces of Hai Phong, Hai Duong, Quang Ninh and Thai Binh were impacted by the floods. The district of Thuy Nguyen in Hai Phong province was the worst affected with 3,390 hectares of flooding, followed by Dong Trieu district (2,379 ha) in Quang Ninh province, and Kien Thuy district (1,650 ha) in Hai Phong province. Approximately 64 kilometers of roads were possibly affected by flood waters in 18 of the 19 analyzed districts. Of this total, roughly 9.6 kilometers were identified in the district of Hai An, located in Hai Phong province. Probable flood waters were also detected within the vicinity of Cat Bi International Airport. It is likely that flood waters have been systematically underestimated along highly vegetated areas along main river banks, and within built-up urban areas because of the special characteristics of the satellite data used. This is a preliminary analysis and has not yet been validated in the field. Please send ground feedback to UNITAR-UNOSAT.